Biography of American Impressionist Landscape/Still Life painter. An important figure in American Impressionism, J Alden Weir is famous for his Impressionist landscape painting, and like his close friend John H Twachtman (1853-1902), was a member of the Cos Cob Art Colony near Greenwich, Connecticut. However, he is also noted for his conservative still life painting, and portraiture. Weir was a founding member of "The Ten", a loose-knit group of American painters who were interested in Impressionism but dissatisfied with the two main artist organizations - the National Academy of Design, and the Society of American Artists - and who came together in 1898 in order to exhibit their paintings to the public. Weir's main contribution to the Impressionist movement in America was to be its patriarch - not because of his advanced age: he was no older than a number of his fellow members of "The Ten," though he outlived several of his close friends among them, such as Twachtman and Theodore Robinson (1852-96). And not because he adopted Impressionism before his colleagues: the fact is, his commitment to the movement was never as total as that of Childe Hassam (1859-1935) or Robinson; he had less contact with French painters than Mary Cassatt (1845-1926) or Robinson; he was less talented than John Singer Sargent (1856-1925); less of a teacher than William Merritt Chase (1849-1916); and his exploration of avant-garde aesthetics was minimal compared to Twachtman's. Weir, however, was a totally sympathetic figure, a warm friend to many of his colleagues, a bridge to some of the major art collectors of the period whom he advised, and sympathetic to artists, art critics and movements of greatly diverse standpoints. In addition to this, and his many artistic masterpieces, not least The Red Bridge (1895, Metropolitan Museum of Art, New York), his value to American art of the time was further enhanced by his organizational ability, and he was often persuaded to take on administrative positions in the art organizations of his day. Weir was born at West Point, the son of Robert Walter Weir, a professor of drawing at the Military Academy, whose earlier pupils included such artists as James McNeill Whistler (1834-1903). The father's contact with the Knickerbocker community of artists, writers and patrons, as well as his extensive collection of rare art books and engravings, was of enormous benefit to his young son, as was the example of his older brother, John Ferguson Weir, a well-known landscape artist, who had already embarked upon an artistic career in New York City when J. Alden went there in the winter of 1867-68, to study at the National Academy of Design schools. John Ferguson Weir was an artist of considerable ability, who became the head of the Yale University Art School for many decades, and whose art appears to have been only marginally influenced by Impressionism, being more influenced by the aesthetics of the Hudson River School and the Barbizon School of landscape painting. J Alden Weir made contacts in New York in his early years that remained with him for life, establishing friendships with Albert Pinkham Ryder (1847-1917) in 1868 and with William Merritt Chase (1849-1916) the following year. Still, it was natural that he felt the pull of Paris by the early seventies, and so in 1873, encouraged by his elder brother and assisted financially by Mrs. Bradford R. Alden, Julian Weir set off for Paris, where he enrolled at the Ecole des Beaux-Arts, under Jean-Leon Gerome (1824-1904). Gerome provided him the basic foundations for his future art, a strong concern with drawing and the structural modelling of form; the academic art that Weir painted under Gerome is among the finest by any American. Weir was impressed by the search for representational truth among the French masters such as Gerome and Leon Bonnat (1833-1922), and he supplemented his studies with the examination of Old Masters, like the sixteenth century German portraitist Hans Holbein (1497-1543) for whom preparatory sketching was paramount. Yet, in his four years abroad, Weir's concerns and sympathies showed a certain subtle shift not uncharacteristic of an aware if basically conservative young artist. Even as early as 1874, he revealed a colouristic interest that was not supported by his training with Gerome, and in the winter of 1874-75, a trip to Belgium and Holland led to a new admiration for the work of Franz Hals (1582-1666), himself an idol of the more advanced artists in Munich; Weir was to admire the work of Frank Duveneck also. Back in Paris he gravitated to the brilliant, light-filled work of the contemporary "little masters" such as Ernest Meissonier (1815-91), but a decisive friendship was formed with the rising young French artist Jules Bastien-Lepage (1848-84), whom Weir had met in 1873. Bastien's balance between correct figure drawing and spontaneous plein-air painting, distinctive in its luminous grey light and atmosphere and firm spatial control leading to a high horizon, and which portrayed the French peasantry on a monumental scale, became a model for searching young artists of Europe and America for the next decade and a half, continuing even after Bastien's early death in 1884. Although Weir's own painting reflected a total commitment to Bastien's precepts for only a short time - unlike that of his countrymen such as Charles Sprague Pearce (1851-1914) or his own close friends in Paris, like Will Low (1853-1933) - elements of Bastien's style were to remain guide-posts, or possibly limitations, throughout Weir's career. And he was to advertise and advance Bastien's reputation with American collectors and artists, even reluctant ones like John Twachtman. At this time therefore, Weir was absorbing elements from both modern art and from its more conservative opponents. Side by side with his appreciation of the rich fluid brushwork of Hals and Carolus-Duran (1838-1917), as well as Paul Baudry's ceiling for the Paris Opera - which became a model for Weir's contribution to the Chicago Columbian Exposition in 1893 - sat his admiration for the academic masters of line: Gerome, Bonnat, and J.A.D.Ingres (1780-1867). Gerome, not nearly so opposed to alternate aesthetic notions then in the air as later historians have made him out, persuaded Weir to go to Spain, but he was surprisingly disappointed with the painting of Velazquez and thought even worse of Goya. In France, Weir's own art followed the course of many young French, British and American painters of his day, avoiding both grandiose historical narrative and radical artistic departures, and applying his new skill in figure painting to scenes of peasant life. Like many he chose the most traditional and picturesque peasants of Brittany, in such genre paintings as A Brittany Interior (1875), a painting shown at the Paris Salon, and Breton Peasant Girl (1875). The appeal of Brittany was based on a number of factors. An art colony existed there where young artists of many nations, notably Americans, congregated at the villages of Concarneau and Pont-Aven in the summers when the Paris schools and studios were closed. Weir, drawn to Pont-Aven by the example of the short-lived, much admired Robert Wylie (1839-77), worked there in 1874, practicing his genre painting of peasant life. These villages offered camaraderie, picturesque subject matter and extremely inexpensive living and models - necessities for impecunious art students. At the same time they provided the subject matter for ambitious young artists to explore a major theme popular both critically and artistically at the time: the unchanging peasant life, simple, pure and supposedly immune to the hectic pace and changing values of the modern world even when, in fact, that traditional existence was becoming increasingly threatened by mechanization and conglomeration. At any rate, Weir, Wylie and other American painters of the peasantry such as Joseph Oriel Eaton (1829-75) and Charles Sprague Pearce were thus joining the second generation of artists such as the Frenchmen Jules Breton, Bastien-Lepage and Leon Lhermitte (1844-1925) in monumentalizing the figures first introduced into modern French art by the pioneer Jean-Francois Millet (1814-75). Weir's first contact with the new movement of Impressionism took place in Paris when he visited the third Impressionist show in April of 1877. It showcased some 230 works by eighteen Impressionist painters, including Claude Monet (1840-1926), Camille Pissarro (1830-1903), Renoir (1841-1919), Alfred Sisley (1839-1899), Paul Cezanne (1839-1906) and Degas (1834-1917), to which the public and critics remained largely indifferent. (For more, see: Impressionist Exhibitions in Paris: 1874-86.) To an artist like Weir, who abhorred Impressionism's unrestrained use of colour, lack of construction and lack of any moral purpose, the new style was simply awful. Referring to the artists as "Impressionalists," he wrote to his parents saying: "I never in my life saw more horrible things. They do not observe drawing nor form but give you an impression of what they call nature. It was worse than the Chamber of Horrors." For its beginnings see: Impressionism: Origins and Influences. For its artists, see: Impressionism: Early History. In late 1877, Weir returned to America. He arrived back in New York at a singularly propitious moment for a young, Parisian-trained painter, for it was the year of the formation of the Society of American Artists. Weir participated in the new organization, and his work was singled out by the influential critic of the Tribune, Clarence Cook, in the review of the Society's first exhibition in 1878. His major work shown at the Society's 1879 exhibition, In the Park, was a dark and dramatic "contemporary" figural scene subsequently cut into three separate sections by the artist, perhaps because of the criticism of the work as crowded and enigmatic. Weir became an important personage in New York art life. He took a studio in the University building in 1878 and then, in 1880, in the new Benedict Building on Washington Square East, along with many of his artist friends such as Eaton, Ryder and the sculptor Olin Warner, whose bust of Weir is one of the finest American portraits of the late 19th century. He was a member of the Tile Club during its decade-long existence, 1877-87. He was active both in the Society and in the National Academy, and with the American Water colour Society, and later in the 1880s with the Painters in Pastel. He taught at the Art Students' League, the Cooper Union and privately. Weir was also active in advising American collectors on acquisitions of European art, both older masters and more recent painters, assisting Henry Marquand and particularly Erwin Davis. Davis became a significant collector, owning works by Weir, Twachtman, Eaton, Gericault, Delacroix, Millet, Corot, Monticelli, Bastien-Lepage and others. Weir helped him to acquire, among other works, Woman with a Parrot and Boy with a Sword, by Edouard Manet (1832-83). Of greater significance to Weir, he aided Davis in securing Bastien-Lepage's great Joan of Arc of 1880, which was shown at the fourth exhibition of the Society of American Artists in 1881. Such a role enabled Weir to return to Europe, travelling with his brother John and with Twachtman to Holland in 1881. In 1883, Weir married Anna Baker. She had a home in Windham, Connecticut, and Weir was able to secure a summer home in Branchville, Connecticut, from Davis in exchange for a painting. The Weir home at Branchville became the centre of an informal artists' colony, with painters such as Robinson, Ryder, Hassam and John Weir visiting frequently and painting there. Twachtman rented a place near Weir in 1887, and then purchased his own home nearby in Cos Cob. The work executed by these artists, some of them among the American Impressionists, evinced an interest in the native and the local: understated paeans to the rural New England landscape. When Ryder visited in 1897, he said he had never seen the beauty of Spring before, the landscape and the air so full of promise. Weir's painting of the 1880s, the first decade after his return from Paris, consisted of conservative but strong figure painting and still lifes. In addition, as well as teaching and art advising, he produced some first-rate portrait art, particularly of male subjects, many of whom were artist-friends (Olin Warner, Arthur Quartley, Albert Pinkham Ryder) or art patrons like Colonel Charles Wood of Portland, a former West Pointer. Weir also painted a good many figure paintings, often using members of his family as his subjects, and in these usually emphasized the theme of domesticity. Weir achieved in such works a remarkable combination of monumental structure with delicate mood, perhaps closer to Whistler than any other source; of one of these paintings a critic wrote of Weir's "customary dark harmony of black and gray," which could describe as well a figure or nocturne by Whistler. Less well-known today are several works closer in manner to Bastien-Lepage, such as Weir's early Good Samaritan or the Burial of the Bird, and several ideal figure works such as The Muse of Music of 1884, which two years later Charles De Kay called Weir's most successful painting, except for his flower pictures. These last, a large series of flower pictures begun in the 1880s, were Weir's most sought-after works. Weir was the Impressionist most involved with still life painting, but his paintings of this theme, though unquestionably among the most gorgeous American flower pictures, are dark and dramatic works, most often contrasting delicate and fragile light roses with glistening, elabourate metal and ceramic vessels. Weir's production of still lifes fell off sharply at about the time he turned to a modified form of Impressionism, though he did not abandon the theme completely, and some pictures of peonies and chrysanthemums - soft, airy blossoms readily adapted to the new aesthetic - are interpreted by Weir in a different manner. In 1884, Bastien-Lepage died, severing J. Alden Weir's ties with his earlier Parisian years, though he was to write the section on Bastien in John Van Dyke's Modern French Masters of 1896. Two years later, in 1886, he was impressed by the show sent to New York by Paul Durand-Ruel (1831-1922), and he found some of its Impressionist paintings remarkable, advising his brother John not to miss the show. At the same time, he turned more and more to landscape painting in both oils and pastel and away from portraiture and still life, exhibiting many canvases in the two-man exhibition and auction he shared with Twachtman at the Ortgies Galleries in 1889. He began to sell quite well, often exhibiting with Twachtman, and at times persuading collectors to acquire a picture by his colleague along with one of his own. Overall, the 1890s saw the development of a more personal style in his art, one nevertheless being shaped by Weir's growing enthusiasm for Impressionism. However, he remained more cautious in his traditional figure work than in the new enthusiasm for landscape. The majority of his landscapes are rural scenes, of the lands around his Connecticut estate: fertile livable farmland. From around 1895 to about 1910 Weir produced his finest paintings in a modified Impressionist manner, with broken but not aggressive brushwork, and somewhat tonal, rather than chromatic, Impressionism, with the emphasis upon a limited palette of varied hues - working with his favourite blue-to-yellow-greens rather than a full spectrum. In a tribute to him, Edwin Blashfield wrote that Weir preferred green haunts and loneliness; Duncan Phillips, calling Weir the finest American landscapist since George Innes (1825-94), spoke of his preference for open hill country, seen near noontime, and for mid-summer. Weir's art was one of gentle modernity, and the theme of modern labour and industry was harmoniously incorporated into some of his finest paintings in a unique and successful way. His series of mill factories painted in Willimantic around 1897 was a tour-de-force of beauty and harmony. Smokestacks and telephone poles coexist with verdant nature, modern factories with New England churches, a modern subject interpreted in a modern style which critics such as Royal Cortissoz praised for their Americanism. Two years previously, Weir had painted his most critically acclaimed painting: The Red Bridge (1895, Metropolitan Museum of Art, New York). 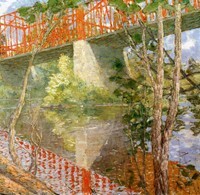 Depicting a truss bridge that spanned the Shetucket River close to Weirs Windham farm, it contrasts the bridge with its surrounding setting by juxtaposing the red paint of the bridge against the green of the wood and the blue of water and sky, and by contrasting the geometric iron structure with the natural sinuous shapes of the trees. Weir was slower to abandon the dark tonalities and Whistlerian Aestheticism in his figure painting: in the works he contributed to the first exhibition of The Ten American Painters in 1898, landscapes such as The Factory Village displayed a far lighter and more colourful approach than the more solidly composed figure paintings. But in works such as The Grey Bodice and The Green Bodice he began to interpret human form with more broken brushwork, though the tones were still far less varied and more neutral than in his non-figurative work; probably the loveliest of these figure paintings is The Orchid of 1899, where woman and flower share the same soft and delicate mood, and critics praised these pictures for their lyrical purity. At the very end of the century, he began painting large figural works outdoors, for example, In the Sun (1899) and The Donkey Ride (1899), and Visiting Neighbors (1903), in which the paint is applied in a tapestry-like manner: long, coarse strokes with a minimum of chiarascuro, and a tendency toward spatial reduction of forms to a single, flat plane. An overall abstract unity is achieved through the undifferentiated surface treatment, in an original aesthetic somewhat akin to Post-Impressionist painting and prefiguring the later technique in America of Ernest Lawson (1873-1939) and Maurice Prendergast (1858-1924). The basic technique is Impressionist however, with long, visible brushstrokes and, with strong concern with full sunlight. Weir was one of the many artists involved in the mural decoration of the Manufactures and Liberal Arts Building at the Columbian Exposition in 1893. It was a landmark in the history of American mural painting because of the magnitude of the commission and the collaboration of many painters, sculptors and architects, but the murals themselves were ephemeral, and given the lack of previous experience at fresco painting by many of the artists involved, their lack of critical success is not surprising. Some of the painters involved did turn largely to mural painting subsequent to the Chicago commission, but Weir was not among them. Nevertheless, his ceiling decorations of The Goddesses of Pottery, Goldwork, Decoration and Printing were among the most favourably received, praised for their simplicity of line and their delicate, evanescent pale purple, blue and green colouring - again, perhaps, related to his new Impressionist interests. Around 1910-11, Weir painted a pair of unusual New York night scenes of the Queensboro Bridge and the Plaza, excursions into subject matter related to Whistler's nocturnes and the urban paintings of Hassam and Birge Harrison (1854-1929). In general, however, Weir's creative inspiration, and to a degree his poetic lyricism also, began to decline in his last decade, though he remained an active if by then conservative painter. He was still a vigorous figure in the contemporary art world, however, and was elected the first president of the Association of American Painters and Sculptors, the group that was to form the International Exhibition of Modern Art which became known as the Armory Show of 1913. He resigned, however, when it was imputed that the Association was formed in opposition to the National Academy of Design, of which he was a devoted member. He did, in fact, exhibit in the Armory Show, and was not unsympathetic to modern paintings of the period, although he was puzzled by Cezanne and offended by Henri Matisse (1867-1954). In 1915 he became President of the National Academy and of the Metropolitan Museum of Art, while continuing to display his work with The Ten American Artists, who had their last exhibition in 1918-19. In 1919, a new revolt against the National Academy was begun by a group calling themselves the New Society of American Painters, Sculptors and Engravers who sought Weir's participation; Weir did join this group, but died soon after. Critical tributes to Weir abounded immediately after his death, though many writers appeared puzzled by a lack of consistency, unsure whether to judge his art as inconsistent or inventively varied. In his own lifetime and immediately afterwards, Weir was a much admired figure, though particularly by critics themselves generally conservative: Royal Cortissoz, Frank Jewett Mather and especially Duncan Phillips. After the memorial tributes that emerged in the several years after his death, however, Weir's art and reputation fell into a semi-oblivion from which it began to emerge only in the early 1950s. He is now seen as a major figure of the American Impressionist movement, a poetic artist of great charm, but not as exciting, colourful or original as his major colleagues. And as with many of his contemporaries, artists such as Dennis Bunker (1861-90), Robert Vonnoh (1858-1933) and numerous others, Weir's art displays a dichotomy, not only between earlier and later styles but also between outdoor and indoor pictures, and between landscape and figurative subjects. Weir is also blessed by the most discerning biographical treatment of any of the major members of the Impressionist group, namely, the 1960 biography written by Dorothy Weir Young, one of his three daughters, all of whom were devoted to their father's memory and his art, and who were often the models for his figure painting. The volume's strength lies in detailing the artist's early life and training in France, where the reader finds the suspicions and misapprehensions of Modernism typical of American artists, opinions that substantially reinforced their devotion to and belief in the principles of the Academies and the standards of the Paris Salon, which they would only reluctantly abandon, even as they became converts to the opposing aesthetics of Modern art later in their careers. Today Weir's paintings hang in some of the best art museums in America, including the Metropolitan Museum of Art, New York; the Phillips Collection, and the Smithsonian American Art Museum, Washington DC; the Wadsworth Atheneum, Hartford, Connecticut; and Brigham Young University's Museum of Art, Provo, Utah. Weir's farm and studio at Branchville are preserved as the Weir Farm National Historic Site. We gratefully acknowledge the use of material from the exhibition catalogue American Impressionism (published by 1980, Henry Art Gallery).  For biographies of other American Impressionists, see: Famous Painters.  For more details of Impressionism in America, see: Homepage.